Gov. 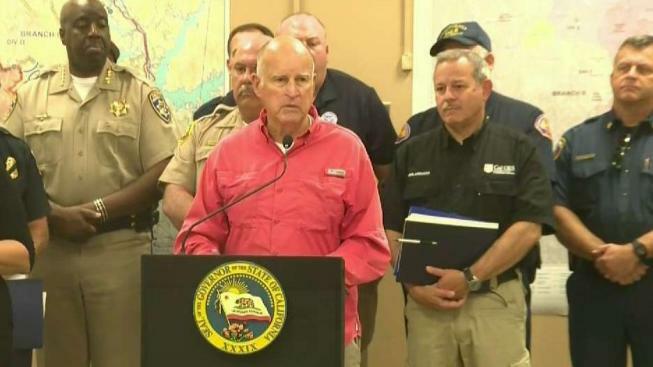 Jerry Brown on Saturday called on President Donald Trump to help California fight and recover from another devastating wildfire season. Sergio Quintana reports. President Donald Trump claimed in a pair of tweets that water that could be used to fight California’s deadly wildfires is being diverted into the Pacific Ocean. "Completely ridiculous," said Peter Gleick, president emeritus of the Pacific Institute for Studies in Development, Environment, and Security in Oakland. "There is no shortage of water." Trump’s tweets, besides failing to offer condolences for the seven people killed, show a profound lack of understanding about the fires, California water policy and the relationship between the two, Gleick said. Trump first tweeted Sunday, "California wildfires are being magnified & made so much worse by the bad environmental laws which aren’t allowing massive amount of readily available water to be properly utilized. It is being diverted into the Pacific Ocean. Must also tree clear to stop fire spreading!" He followed up Monday with, "Governor Jerry Brown must allow the Free Flow of the vast amounts of water coming from the North and foolishly being diverted into the Pacific Ocean. Can be used for fires, farming and everything else. Think of California with plenty of Water - Nice! Fast Federal govt. approvals." But California fire officials report no problems getting water to fight the 17 fires burning in the state. "The fires are all by reservoirs," said Scott McLean, a spokesman for the California Department of Forestry and Fire Protection, or Cal Fire. "We've got plenty of water." The Mendocino Complex fires, made up of the Ranch and River fires, is on the edge of Clear Lake. The blazes have burned 283,800 acres, or 443.4 square miles, to become the largest wildfire in state history. At the same time, the Carr Fire about 200 miles north of San Francisco has surrounded Whiskeytown Lake and is near Shasta and Trinity lakes. Even without the reservoirs, firefighters would be able to draw pull from creeks, streams, ponds and lakes or run water from tanks to helicopters, McLean said. What does make fighting the fires difficult is the weather and the terrain; the northern part of California hit triple-digit temperatures early in the year, he said. Although California’s five-year drought was broken during the 2016-17 year, the U.S. Drought Monitor categorized much of the Northern California coast and Sierra Nevada as abnormally dry, the Santa Rosa Press Democrat reported at the beginning of last month. "We're two to two and a half months ahead of the drying cycle of vegetation in our state," McLean said. "We're seeing the results. It's so volatile. There's just no moisture in the plants." Gleick said that Trump’s tweets ignored the human-caused climate change that has made the fires more severe: the severely dry conditions, high temperatures and strong winds. Almost all of the energy and environmental policies proposed by Trump would worsen carbon emissions, he said, whether rolling back vehicle emission standards, revoking the waiver that allows California to enforce tighter standards,reviving the coal industry or failing to regulate power plants. "All of those things are moving us in the wrong direction," he said. Water in California's rivers is already managed and allocated and some farmers and representatives in the Central Valley want to roll back environmental protections for the state's salmon fishery and have argued for more water to be used for irrigation. The California State Water Resources Control Board announced plans instead to increase water flows into the San Joaquin River, which empties into the Pacific Ocean, the Los Angeles Times reported. The California governor did not respond to Trump's tweets. At a news conference last week he said that climate change had left the state with fires of greater intensity and for more months of the year. "We're in for a really rough ride," Brown said. "It's going to get expensive, it's going to get dangerous, and we have to apply all our creativity to make the best of what is going to be an increasingly bad situation."